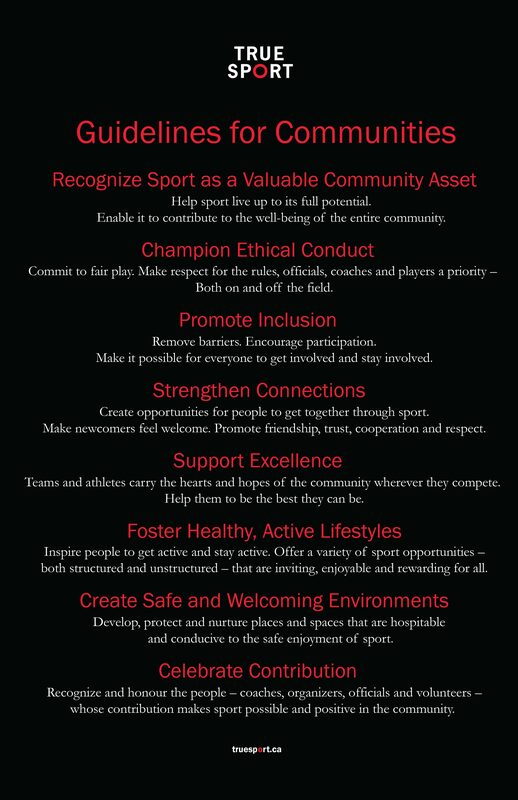 The True Sport Guidelines for Communities are action statements that describe how communities can put True Sport into action. They can be used as a benchmark or a simple reminder about what is trying to be achieved through sport. Good sport communities value every individual child and adult who participates. They do so because they believe that every participant has the right to true competition that is fair, safe and open to all. In a values-based and principles-driven environment, sport comes closer than almost any other cultural activity to delivering equal opportunity for all. Children instinctively understand that the rules need to apply to everyone if sport is to have meaning for anyone. Ample evidence suggests that how we play together shapes the way we live together. Help sport live up to its full potential. Enable it to contribute to the well-being of the entire community. Commit to fair play. Make respect for the rules, officials, coaches and players a priority – Both on and off the field. Make it possible for everyone to get involved and stay involved. Create opportunities for people to get together through sport. Make newcomers feel welcome. Promote friendship, trust, cooperation and respect. Teams and athletes carry the hearts and hopes of the community wherever they compete. Help them to be the best they can be. Inspire people to get active and stay active. Offer a variety of sport opportunities – both structured and unstructured – that are inviting, enjoyable and rewarding for all. Develop, protect and nurture places and spaces that are hospitable and conducive to the safe enjoyment of sport. Recognize and honour the people – coaches, organizers, officials and volunteers – whose contribution makes sport possible and positive in the community. Order a full-size vinyl banner for your entire group to sign and hang with pride. Please contact us for a quote.